Throughout the history of Zandvoort, when only a few streets had names, Kerkstraat divided the town into a northern and a southern part, and locations were taken from this street. It was only in the nineteenth century that more streets acquired their own names. The first town hall was built on the Kerkstraat in 1873 and it served this purpose until 1912 when the present town hall on Raadhuisplein (then called Tramplein) came into use. The first official Post Office was also built on the Kerkstraat and served this purpose between 1850 and 1899 at the site of the present number 28. 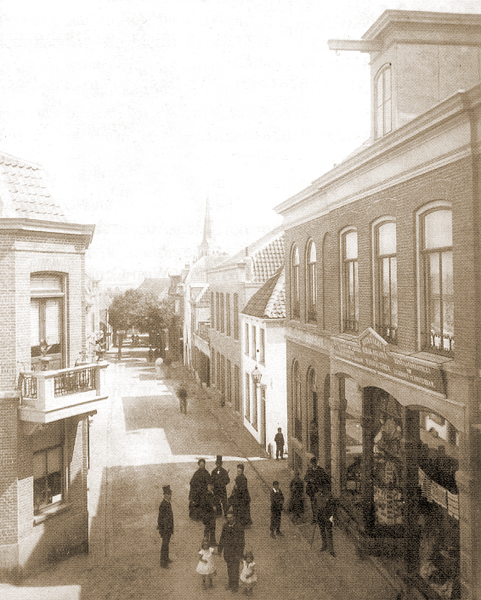 The street was sometimes called Dorpsstraat: it was so named in the 1881 edition of the Badcourant. From that time onwards it began to develop into one of Zandvoort’s most important – and centrally located – shopping streets. It did not remain untouched by the great demolition of 1943, and both its side streets, Bodeweg and Buureweg were destroyed.